If you have a proclivity for slot machines with a dinosaur theme and a swashbuckling adventure, then you will enjoy the Grand Journey by Microgaming. This new watershed internet slots takes you back to a prehistoric age. The Grand Journey is a 5 reel (non progressive), 30 payline video slots. 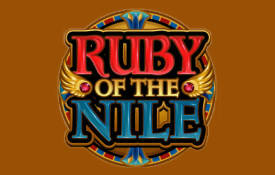 It comes with a wild symbol, multiplier and free spins and offers a maximum jackpot payout of $12,000. Unfortunately high value card symbols are absent. Symbols showcased across the reels are the explorer, an Amazon female, the T-Rex, the Saber Tooth tiger, the volcano, the temple, the forest and the explorer’s kit. The animations and symbols are eye-catching. Once the game open us you’ll note the following: The volcano spews forth tons of red hot lava, the T-Rex prepares to attack, the forest is teeming with wild life and the Amazon woman is ready to hurl her spear. The Grand Journey is flushed with various symbols and winning combinations. The wild symbol is the Grand Journey logo. It doubles payouts and appears stacked across the reels when substituting winning combinations. Microgaming has pushed the envelope with this internet slots by adding an additional wild symbol. The additional wild symbol is the time machine, it can appear anywhere on reel 3. For additional wins it expands to make the entire reel wild. The scatter symbol are the globes (earth). When two or more earth symbols appear anywhere across the reels scatter payouts ensue. The free spins round is activated when three or more scatter symbols appear. Up to 15 free spins are awarded. Microgaming introduced its latest free spins innovation – the multiplier trail. By default all the paylines are enabled and if you’re in for a penny in for a pound you can bet up to 20 coins per payline. The coin denomination ranges from $0.01 to $0.02. The maximum bet amount per spin is 12 credits. In the main game, 20,000 coins is the maximum line payout which translates into 400 credits making The Grand Journey slots suitable for low rollers. The first payout table displays the Free Spins bonus that is triggered when 3 or more scatter symbols appear anywhere on the reels. 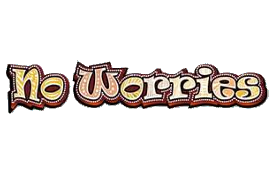 When the Free Spins bonus is triggered you will receive 15 free spins with a multiplier that starts at 2x that could potentially reach 10 times. During the Free Spins bonus, each spin that does not win increases the multiplier value by 1x. A win during the free spins resets the multiplier back to 2x. Unfortunately the Free Spins cannot be re-triggered. In the free spins round you can win as much as 600,000 coins! In summary. 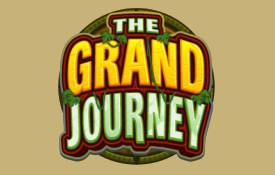 The Grand Journey slots machine is not only an adventure themed slots but suitable to players from all walks of life. It offers a jackpot payout of 600,000 coins during the free spins round. The coin denomination of $0.01 up to $0.02 leaves a lot to be desired but up to 20 coins per payline can be staked which more than makes up for this. It won’t appeal to high rollers but suitable to low and medium rollers. We recommend you play The Grand Journey at these Microgaming Casinos.